Rock legend's extravagant rock show performing a classic album. With seemingly every established rock act currently touring in celebration of X years in existence or playing the whole of an album that was released Y number of years ago, Rick Wakeman has decided to do something a little different. His successful solo album, ‘The Six Wives Of Henry VIII’, was originally released in 1973 – so no nice round anniversary figure there! 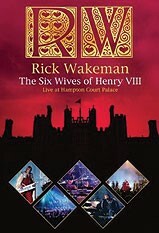 However, it’s actually to commemorate the 500th anniversary of Henry VIII’s ascension to the throne that Rick managed to persuade the powers that be to allow this grandiose performance of the whole album in the grounds of Henry’s former home, Hampton Court Palace. The enormous stage is big enough to house Wakeman and his latest incarnation of the English Rock Ensemble, the English Chamber Choir and the whole of the Orchestra Europa, totalling by my reckoning just under a hundred people, who all together might just make as much noise as narrator Brian Blessed. For his part, Blessed was the perfect choice and attacks his role with gusto, even ad-libbing at times to the obvious amusement of Wakeman and his band. The show features not only great versions of all six pieces of music on the original album, but it’s bookended by two brand new pieces of music (‘Tudorture’ and ‘Tudorock’) that are every bit as majestic as the older tunes. The real treat for long-term Rick fans is the inclusion of ‘Defender Of The Faith’, a piece that was dropped from the original album for space reasons, and it’s testament to the quality of the three unheard tunes that they flow seamlessly with classics like ‘Catherine Of Aragon’ and ‘Katherine Parr’. The concert is visually stunning, even without Blu-Ray, with the lighting so spectacular that it’s sometimes easy to forget that the backdrop is actually the palace itself and not some elaborate scenery. Musically the whole thing holds together surprisingly well, with Wakeman, in a plethora of increasingly spectacular capes, on good form. The ERE, featuring such notables as the legendary Ray Cooper on percussion, former Jethro Tull bassist Jonathan Noyce and Rick’s son Adam on additional keyboards, are impeccable throughout and each member adds a little something to the mix. As anyone who’s seen his chat show on Rockworld TV will attest (or his other TV appearances on things like Grumpy Old Men and Countdown for that matter), Rick is equally at home when entertaining without his keyboards, so the bonus material ‘Behind The Scenes With Rick’ is as light-hearted and watchable as you’d expect. If you’re a big Wakeman fan this DVD is essential, but if, like me, you’re a lapsed fan who hasn’t bought any of Rick’s releases in years, it’s still essential.